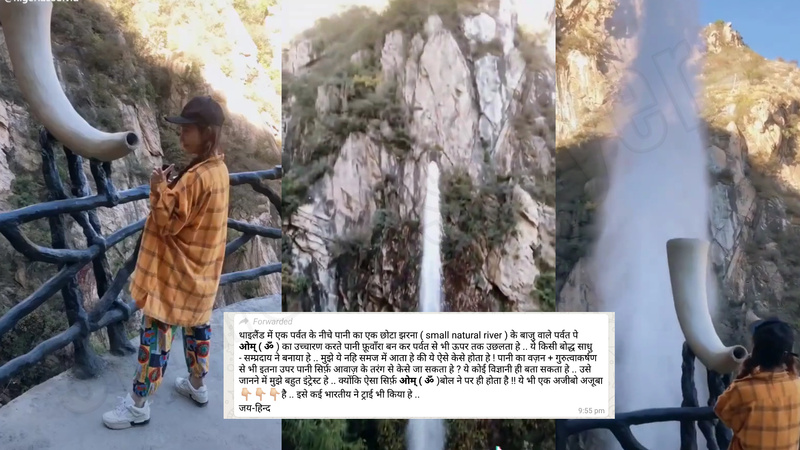 A video has recently been viral on social media claiming power of ‘Om’ or a miracle, which shows a girl who is standing on a cliff enclosure in a hill station and utters a sound (sounding like Om) in the trumpet, following which a huge gush of water is seen (like a fountain.) The video is very intriguing, and has also made way to platforms like TikTok, especially in countries like Philippines. “थाइलैंड में एक पर्वत के नीचे पानी का एक छोटा जरंना ( small natural river ) के बाजु वाले पर्वत पे *ओम् ( ॐ* ) का उच्चारण करते पानी फ़ूवाँरा बन कर पर्वत से भी अपर तक उछलता हे .. ये किसी बोद्ध साधु – सम्प्रदाय ने बनाया हे .. मूँजें ये नहि समज में आता हे की ये ऐसे केसे होता हे ? पानी का वज़न + गुरुतवाकरशं से भी इतना अपर पानी सिर्फ़ आवाज़ के तरंग से केसे जा सकता हे ? ये कोई विज्ञानी ही बता सकता हे .. उसे जान ने केलिए मूँजें बोहात इंट्रेस्ट हे .. क्योंकि ऐसा सिर्फ़ *ओम् ( ॐ* )बोल ने पर ही होता हे !! ये भीएक अजीबो अजूबा हे .. इसे कई भारतीय ने ट्राई भी किया हे .. Translation: There is a small natural river under a mountain in Thailand, and if you chant Om from the neighbouring mountain, the river turns into a fountain and gushes up. This was made by a Buddhist Saint. I don’t understand how can the water gush up by defying gravity? Only a scientist can tell. Even I am interested to know, because only when you chant Om does this happen. This is a miracle and some Indians have also tried it. Jai Hind! The video is true, but the context is wrong. Moreover, the video is NOT from Thailand, and there is NO ‘natural’ river, but an artificial fountain! Extensive searching led us to an Indonesian YouTube channel called The Shiny Peanut. There was a video (with the thumbnail of the girl) which spoke about fountains operated by sound, which is totally man-made. These videos do not work only on chanting ‘Om’, but on just shouting in the mike, which can be seen in the videos below. On further searching on YouTube, we found out that the location in the viral video leads us to such a fountain in Mt. Cangshan in China’s Shaanxi Province. The fence and the topography of mountains are very similar. The video is NOT a natural river in Thailand. The ‘river’ does not jump or gush upwards by chanting ‘Om’ as claimed. The person just has to make a sound in a microphone which is connected to a control room. On receiving the sound, equipment in the control room processes it and accordingly sends signal to the fountain to gush water out. The more the sound, the more the intensity of the gush. Guess this answers the question. थाइलैंड में एक पर्वत के नीचे पानी का एक छोटा जरंना के बाजु वाले पर्वत पे ओम् ( ॐ ) का उच्चारण करते पानी फ़ूवाँरा बन कर पर्वत से भी अपर तक उछलता हे .. ये किसी बोद्ध साधु – सम्प्रदाय ने बनाया हे …! !पानी का वज़न + गुरुत्वाकर्षण से भी इतना ऊपर पानी सिर्फ़ आवाज़ के तरंग से कैसे जा सकता हे? क्योंकि ऐसा सिर्फ़ ओम् ( ॐ ) बोलने पर ही होता हे !! थाइलैंड में एक पर्वत के नीचे पानी का एक छोटा जरंना ( small natural river ) के बाजु वाले पर्वत पे ओम् ( ॐ ) का उच्चारण करते पानी फ़ूवाँरा बन कर पर्वत से भी अपर तक उछलता हे .. ये किसी बोद्ध साधु – सम्प्रदाय ने बनाया हे …!! थाइलैंड में एक पर्वत के नीचे पानी का एक छोटा जरंना के बाजु वाले पर्वत पे ॐ का उच्चारण करते पानी फ़ूवाँरा बन कर पर्वत से भी अपर तक उछलता हे ये किसी बोद्ध साधु – सम्प्रदाय ने बनाया हे muje ये नहि समज में आता हे की ये ऐसे केसे होता हे ? ← Did two terrorists enter Sikar bus depot and killed a citizen ?